Ever since WhatsApp launched the feature of ‘groups’, our phones have been pinging non-stop. While groups are good for sharing information and updates, what annoys most of the users are the forward chains that start and never seem to end. With WhatsApp, we landed right back into history with chain forwards and wrong information that started to spread unnecessary panic among the masses! From July 10, 2018 onwards, WhatsApp started labelling forwarded messages so that recipients could understand if the message was originally written by the sender or was just a pass-on. This was done to promote a safer online space and to keep fake news from spreading too far and wide, too fast. WhatsApp, therefore, took it upon itself to spread the message that one should not misuse the platform and in accordance with the same, released three short videos that reinforced the message – WhatsApp Groups should be used more productively. These ads were released on WhatsApp’s YouTube channel on December 2, 2018 with three different personas – Rajat, the college student; Kavya, the girl who created a family group and Geet, the recipe queen. The need to create these ads arose from the fact that things got out of hand in such a way, the messaging giant had to launch first-of-its-kind television ad in order to run their campaign, asking people to be vary of the messages they send and receive. The ads are available for viewing on YouTube in ten regional languages. 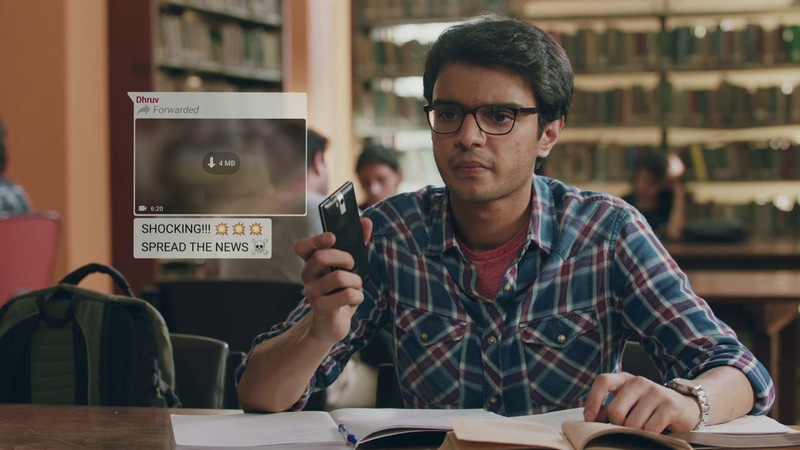 In this, Rajat has to talk to a fellow classmate after he sends in a message which propagated wrong information. Similarly, Kavya has to confront a family member for sending a forward without checking the facts first. She explains to him why it is a wrong practice and tells him not to send such forwards. Finally, there is Geeta – the Recipe Queen. In her group, there are a lot of people who were added by other group members, because they too must have had admin rights. She doesn’t personally know all of the people who are on her group, benefitting from her recipes. When she receives a forward from an unknown number – she decides to delete the text and block the person. All three scenarios are relatable and make you nod in agreement as you watch the videos progress. These ads help people explain other people why forwards (which do not have a shred of evidence to support them) should not be sent on WhatsApp Groups and how they end up spreading rumours and panic! By popular demand, WhatsApp finally appointed Abhijit Bose as the India head, following a few important requests made by the Indian Government. The ‘Spread Joy Not Rumours’ campaign definitely seems to have resonated with all the users of WhatsApp.